In todays world we have all been influenced by TV and the movies. Unfortunately the movie “It ” (which I personally have never seen) ruined the magical world of clowns for many a young soul. I love clowns! Partially because they are happy, colorful and energetic. Their whole purpose is to help you forget about a bad day. They say laughter is the best medicine and while it will not cure cancer, it can still lighten the load for a child who is suffering from the illness. Sometimes something as simple as a balloon animal given to a child at a restaurant can change the tone of the whole meal. Sometimes the smile brought on by a site gag can make a world of difference for an emotionally distraught teenager and provide them with a much needed escape if only for a few minutes. I am not saying that laughter brought on by clowns will change the world but it couldn’t help but make it a better place if only for a little while. So I believe in the power of clowns! That being said I find that the art of capturing the image of a clown complete with the little sparkle in the eye and the hint of a smile, if not a full blown smile ,has not been truly accepted in the art world. As a case in point, I can’t seem to find a gallery that has its focus on clown portraits…. surprised? Not really but I do feel that the images of clowns do have a place in the art world. 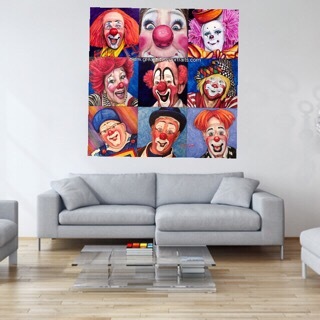 There are probably display spaces for Clown portraits at such places as Ringling Bros. and Barnum & Bailey Circus at the John and Mable Ringling Museum of Art Circus Gallery in Sarasota, Florida, or the International Clown Hall of Fame and Research Center. I am also wondering if Circus Circus in Las Vegas has a gallery? I am not sure as I have not visited these establishments. I hope to someday visit each site and report back to you here about the wonders found. The clowns I see most depicted in portraits are the Master Clowns from Ringling Bros. and Barnum & Bailey Circus I was informed not long ago by a friendly clown that the time and opportunities are not available to todays clowns to achieve the credentials needed to achieve the master clown status. So there are a limited number of clowns that have reached that status. Also other famous clowns such as Emmett Kelly, for example, of which we have all seen wonderful paintings of. I will probably not be painting the famous clowns. Not unless I can find a free photo to use or can personally meet them to take my own photo. I like to have permission to use the photos that I paint, since a lot of the master clowns are no longer with us and Ringling owns the rights to a lot of the images … we we will just have to see what develops. 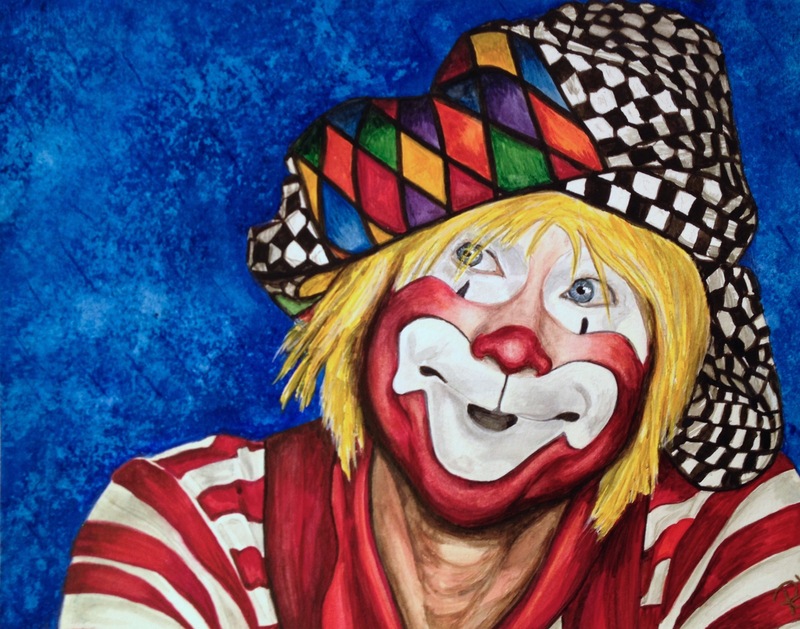 Please stop by to check in and learn with me about new and old artists in clowning and the artist that depict them in there art. I will also post links to each clown and we will have images for you to view. Let me know if you would like to be interviewed of it you know of a clown that would like to be interviewed. Thanks for following my blog! I’ve never met a clown artist. That’s pretty cool. Maybe I could interview you sometime? I’m sad that clowns get a bad rep. Perhaps that’s why hobo clowns frown? I like your blog you have a unique outlook on life. I would love to be interviewed in the future. I am working really hard getting my blog up and running. Thanks! I just posted a new article. I hope you enjoy my wackiness. Love your wackiness. Hope you will share my page with your followers. We all can use a little more happy clowns in our lives.